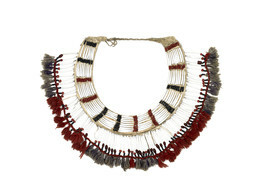 This woman’s necklace from the Tahltan people of the upper Stikine River in British Columbia is a wooden collar covered with tanned skin and decorated with beads, dentalium shells, and wool tassels. At the time when a girl first started menstruating she withdrew from the community for a year or more, wore special clothing, and underwent training in the skills of women. For her “coming out” when she reentered society, a woman of high rank and wealth would put on a beaded ceremonial collar like this one.